Serbia had held on far longer than most would have expected after the war started. It was now time for Germany, Austria, and a new entry Bulgaria to target the tiny Balkan country, and it would be the end. We will also be spending some time looking at the only real effort by France and Britain to directly help Serbia when they landed troops at a the Greek port of Salonika. We will look at why the Allies ended up sending the Troops to Salonika, what they did when they got there, and how they ended up sticking around until the end of the war even though they had already failed at their one job, which was to help Serbia. We are here now at the end of our episodes discussing the events of 1915. I held this topic until the end of the year because I think it fits quite well and brings us to what I think I might call the end of the beginning of the war. I call it the end of the beginning because it sees the fall of one of the countries that started it, Serbia. Serbia had held on far longer than most would have expected after the war started. It was now time for Germany, Austria, and a new entry Bulgaria to target the tiny Balkan country, and it would be the end. We will also be spending some time looking at the only real effort by France and Britain to directly help Serbia when they landed troops at a the Greek port of Salonika. We will look at why the Allies ended up sending the Troops to Salonika, what they did when they got there, and how they ended up sticking around until the end of the war even though they had already failed at their one job, which was to help Serbia. Bulgaria would enter the war for several reasons, the first was simply that they did not like Serbia after the tiny country had defeated them in the Second Balkan war just 3 years earlier in 1912. This dislike made the leaders of Bulgaria concerned about their position in the Balkans should Serbia be on the winning side, even if they were on the same side as Serbia. It was inevitable that if Serbia was on the winning side the small country would absorb hefty chunks of Austria-Hungary while the expansion opportunities for Bulgaria would be greatly limited. The possibilities for expansion was the second big reason that Bulgaria made the decision that she did. When Bulgaria started exploring the going price for a neutral country with an army of over half a million she found the going rate quite good, especially if the buyers were Germany and Austria-Hungary. They could give Bulgaria everything that she wanted, which was mostly stuff taken from it during the Second Balkan war, so most of Macedonia. There was also a cherry added on top of Macedonia because Bulgaria would also be given pieces of Serbia as well. The Allies, try as they might to bring in Bulgaria on their side just simply could not match this offer. They were allied with Serbia and could not promise Serbian territory to Bulgaria. One final piece of the Bulgarian entry was just the situation in 1915. Throughout the last 41 episodes we have been talking about nothing but victories for Germany, Austria-Hungary, and Turkey. By late summer the biggest threat to Bulgaria, Russia, had just got beat down on the Eastern Front and was looking like a shattered mess. The one attempt by Britain and France to get involved in the region was Gallipoli, and in September the men of the British, ANZAC, and French divisions were still stuck on their beaches. The Italian campaign was just a straight disaster. When looking at all three of these factors, the hatred of Serbia, the rewards promised to them, and the Allied situation in 1915 it seems that the only question to ask was when Bulgaria would enter the war. The answer to that question would be September 6th, 1915. After entering the war the conversation with the German High Command quickly came around to what should be done about the Serbian problem. The Serbian problem could be defined as "Why does Serbia exist?" to which the unanimous answer is 'We should make it not exist.' And that is what they would do. But before they could do that, something else should have happened when Bulgaria entered the war, and that something else involved Greece. Greece was supposed to enter the war against Bulgaria if Bulgaria declared war on Serbia. This was from a treaty between Serbia and Greece that predated the current war and was signed after the Second Balkan War. When the time came for Greece to make her move the Greek Prime Minister Venizelos, and I am sorry but I am not even going to attempt his first name, wanted 150,000 troops to be landed in Greece before he would declare war. He did not care who the troops were, French, British, Italian or where they came from, Venizelos just wanted bodies. Once the troops were in Greece, then and only then would he try to pull Greece into the war, the key word there is try, it still would not guarantee Greek entry into the war. The French readily agreed to contribute troops to the cause although they wanted the British to bear most of the burden, pointing to their primary role on the Western front as the reason. If the British would contribute anything was far from certain. In London there was disagreement among the government, and especially between Kitchener and David Lloyd George. Kitchener was against the entire campaign, his sticking point was the fact that there was not a guarantee from Greece about entry, just that "maybe kinda sorta" promise. Even over Kitchener's objections British troops would be going to Salonika, although it was agreed with the French that the British troops would be used strictly to defend Salonika, they would not be going on any Balkan adventures. The fact that David Lloyd George would eventually win the argument is a good an indication as any of Kitchener's fading influence in London. There was one tiny little problem with landing British and French troops in Greece, the country was still technically neutral. That means that they could not let the troops land without declaring one way or the other in the war. The Greek government would protest the sending of troops, and protest it loudly, but while they were protesting they were also preparing for the arrival of the troops. Now this whole situation would have been a lot less complicated if Greece just entered the war, but it was only when the troops were ready to land that the "maybe kinda sorta" promise to enter the war became a "maybe kinda, nope no way." This chance was driven by King Constantine who decided that Greece would stay neutral. The King believed that Greece would be better off to stay out of the war for now, oh and he was also married to the Kaiser's sister, so that helped. Prime Minister Venizelos still strongly disagreed with this decision and the differences became irreconcilable and on October 5th and Venizelos was dismissed from his position as Prime Minister. Venizelos does not completely leave the histories though and he will be back in 1917 when he would lead a new Allied recognized government after the abdication of the King. But for now, and for the duration of 1915 and 1916 Greece would remain neutral, but they did allow the British and French to use the port of Salonika as long as they needed it. Salonika is a Greek port in the Aegean in Macedonia, its current name is Thessaloniki and it is currently the second largest city in Greece. It had been taken by Greece during the First Balkan War, where it and all of Macedonia was taken from the Ottoman empire. I will be using the name Salonika for the rest of this episode since it is the name most used in histories of the war. There was a serious problem with using the port of Salonika in an effort to assist Serbia, this problem was that there was only one rail line that led into Serbia from Salonika. The French knew that this was the case, but there was not a better option. With so little rail capacity in the area the troops moving from Salonika to the Greek Border with Serbia would have to walk all of the 200 miles which could not have been a fun prospect. The troops that would land would be put under the command of General Maurice Sarrail. Sarrail had been an army commander when the war started, but Joffre had relieved him of his command during the summer of 1915. Joffre gave Sarrail the task of commanding the troops at Salonika not as some reward but instead just to get rid of him, and in that regard Joffre was successful. The reason he wanted Sarrail gone was because Sarrail was openly socialist and a freemason, which conflicted with both Joffre's beliefs and political situation. The fact that a self declared socialist was able to continue to rise so high in the French army, a body dominated by Republican and Monarchists, is somewhat impressive. Sarrail would be given the task of commanding the French troops at Salonika and there were divisions in route in September, one of which was pulled out of Gallipoli for the task. With the first set of landings there were 50,000 troops that would go ashore and more troops would move in over the next several months. As more and more troops moved into Salonika it became a health nightmare. This is the same story that we talked about at Gallipoli earlier in the year, and in the Middle East just a few weeks ago. Tropical diseases ran rampant through the army camps with malaria and dysentary topping the list of ailments. There were even situations where entire units were done with the various sicknesses that afflicted the men. Before we move into the Serbian campaign, lets talk a bit about the legacy of Salonika. The entire Salonika campaign from its inception until almost the end of the war gets very little love from historians and before the end of this episode I hope you understand why. But here is John Keegan's take on the effect of the troops at Salonika from his book The First World War "Within, in an area of 200 square miles, the French encamped three and the British five divisions, and together created an enormous stockpile of stores and war matériel. Strategically, their presence exerted no pressure at all on either the Bulgarians or the Germans, who maintained a scratch force on the frontier. It drew no enemy force away from the Western Front, brought no aid to the Russians and posed no threat to the Turks." The entire reason the troops were at Salonika was to help Serbia. By my calculations it has been roughly 470 days since Episode 12 when we last talked in any real depth about Serbia's situation. After the first few months of the war and the failed Austro-Hungarian offensives the Serbian front had quieted down while Conrad's focus was elsewhere. Unfortunately for the Serbs they would never be able to capitalize on this lack of focus and they were forced to sit on the defensive inside their borders and just wait for events to move forward. When the war came back to Serbia, after being surrounded and cut off for so long, their only hope was help from the outside. The Serbian army was low on every conceivable resource, bullet, shells, clothes, even food, the only thing that was in shorter supply was reserves. The 11 divisions that made up the Serbian army were also now riddled with disease after spending over a year in the field and their only hope was a strong push out Salonika that never came. After the crushing Russian defeats of summer 1915 and the fragile stalemate on the Italian front the leaders of Austria-Hungary could again shift their eyes back to the small country that had played such a role in starting the role. The fact that Bulgaria entered the war was just icing on the cake. This wasn't 1914 though and the Austrians were not able to, or really more like not allowed to, go into Serbia without German support. In a somewhat surprising change considering how much he had fought German reinforcements going to the Austrian front so far, Falkenhayn provided that support in the form of the 11th Army. General Mackenson was put in charge of the German and Austrian forces that were assigned to capture Serbia. His plan for the attack was to attack on as wide a front as possible to spread out the Serbian forces. He would also coordinate his attack with a Bulgarian attack of 200,000 men bringing their combined total to over 500,000. The Bulgarian attack was more than about just numbers though. Since the start of the war nearly the entire Serbian army had been concentrated on the northern and eastern borders of the country to defend against Austria. When some of the forces were moved south they found a border that had no prepared defensive lines and no time to create them. The campaign was a foregone conclusion, the Serbians could have been the greatest army in the world at this point in the war and they still would have been forced out by sheer weight of numbers. The only question now was how long the Serbians could hold out. The final countdown for Serbia would begin on October the 5th as the bombardment began. The next day the attack was launched across the Danube and Drina rivers and unlike the first month of the war when the Serbian forces had held the line at the rivers this time there was no stopping the onslaught. Both of the rivers were decisively breached in under a day and just two days later on October the 9th Belgrade was captured. This was not a huge deal, Belgrade was near the Austrian border and was a completely indefensible. After the initial advance the Serbians were able to slow down the advance a bit, but the retreat, once started, would never truly end. They were just never able to get a new position fully consolidated especially since on the 9th the Bulgarians also began their attack. They attacked from the east and drove towards the city of Niche and Skopje. During this time The biggest problem for the Serbians had nothing to do with the territory they were losing, but instead the fact that the Bulgarians were advancing so fast that there was a good chance they would cut off the Serbian retreat. The northern forces started retreating faster to keep pace with those in the south and the call went out to the British and French that if they were going to do something with those forces at Salonika it had to be big and it had to happen very soon. Not only did the attack need to be launched soon for Serbia's sake but also because about half of the Bulgarian army was attacking directly towards the only rail line running from the port to the Serbian border. Sarrail agreed to attack, but did not agree with the Serbians on where he should attack to. Serbia wanted him to march to Niche, which was about 150 miles from Salonika. Sarrail just straight up refused to entertain this idea believing it was just too far into Serbian territory. Sarrail was concerned that his troops would be cut off in Serbian without access to their supply lines. 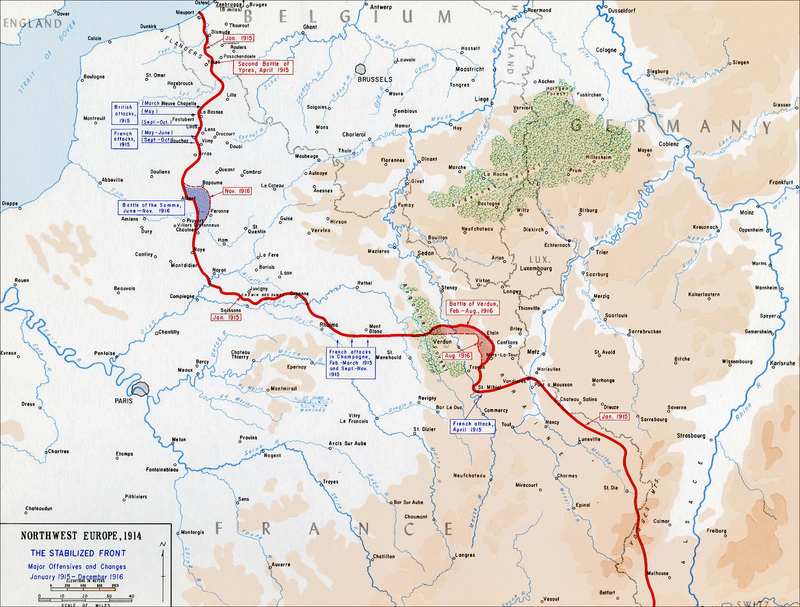 Next the Serbians requested he advance to Skopje, which was about half the distance at 75 miles. Again Sarrail thought this would be an unwise move. Sarrail would summarize his reason for refusal by saying simply that "One cannot do something with nothing." The timer on Serbia was running during all of these discussions and word of Sarrail's decisions had made their way back to France and on October the 15th he was forced to move French troops into Serbia. Unfortunately it was simply too late and the Bulgarians had been able to get between the French advance and the Serbian retreat. Sarrail would leave his forces in Serbia for over a moth, but eventually it became apparent that the troops were not serving a purpose, on November 23rd the order was given to retreat. While the French were deciding whether or not to help, the Serbians continued to be in full retreat through their country. The Germans, Austrians, and Bulgarians were all trying to cut off their retreat to complete the destruction of the Serbian Army, but they were just never able to get it done. The fact that the Serbians were able to avoid encirclement is even more surprising when you consider the fact that they had 10s of thousands of civilians and Austrian prisoners of war with them. They were almost caught at Kosovo, but after slipping away they made their way into Montenegro. The retreat then continued through Montenegro and into Albania and from there to the Adriatic sea. The hope was that on the Adriatic they could be supplied from the sea by their allies. The road through Albania was hard and somewhere around 50,000 soldiers and civilians were lost in the journey over the mountains. Most of these deaths were due to disease, starvation, and exposure to the cold. The Serbian president, Nikola Pasic, was very disappointed in his allies and made it very well known that he blamed their indecisiveness for the fall of his country.The fact that the French forces under Sarrail had been unable to make a decisive move to save Serbia was a contributing factor to the fall of the French government that we discussed in Episode 54. The long term goal of reaching the coast was that they would be evacuated by the Royal Navy and the Italian Navy but it would take several months, all the way until February 1916 before all of the Serbians were on the Greek Island of Corfu. 150,000 evacuees reached the island, but many would die after reaching it, never able to recover from the hardship of the mainland. Even with all of these losses the Serbian army would recuperate on the Greek Island and would eventually move to Salonika to assist the British and French. In fact Serbia would never officially surrender and would play a role in the last months of the war when the forces in Salonika finally fulfilled their role and advanced into the Balkans. The advance into the Balkans at the end of the war was almost 3 years in the future, and for now there was some debate about whether or not the troops should stay at Salonika. This was another of the topics discussed at that all important meeting between all of the allies in Chantilly. The topic of Serbia was discussed on December the 4th. The positions going into the meeting were that the British wanted to leave and the French wanted to stay in Salonika. David Lloyd George was one of the few British representatives at the conference who wanted to stay. His reasoning was that a breakthrough into the Balkans could not be more difficult than in France, so why not send troops there. Even with George's support it became apparent that the British simply would not budge on leaving, and so the first day ended with the French also agreeing to moving the troops out of the Salonika. While this was the agreement on the 4th of December, the next day the French Council of Ministers just decided that they were not okay with that being the decisions. They put their heads together and formulated an argument that would get the British to change their minds. A critical piece in the argument came from the Russians. At the meeting on the 6th the British were faced with a united front from both France and Russia, Joffre had even went so far as to write up a specific plan of action and circulated copies to the French and Russian representatives. The Russians started the meeting with an impassioned speech emphasizing the importance of tying up any possible Austrian and German troops. After the Russian delegates had completed their part Joffre took the stage, part of his reasoning for staying at Salonika was put into the official minutes of the meeting like this "The decision of the allies to abandon Salonika wil worsen the strategic situation in the present and the future; it will complicate the political situation on the Turkish front and compel the Romanians to submit to the will of our adversaries." Even with all of this pressure, the British still did not agree to stay. On December 9th and then again on the 11th the British and French met again to discuss the Salonika question, and finally, at the last meeting, the British agreed. The agreement was extremely specific about the role that British troops would play, they agreed to stay in Salonika and help fortify the port, but they would not advance beyond the current Salonika base. They were there strictly to defend the port, there would be no Balkan adventures. Even with this agreement, the British clearly stated that they were only agreeing to stay for the near future, and that this would be a point of discussion later. One of the reasons that British were so adamant about not launching offensives was because they were already preparing for the 1916 offensives in the spring, and did not want to divert any resources from the effort. After the British had made their position clear the French decided that operations out of Salonika were unfeasible for the time being. The French General Staff estimated that to do anything meaningful in the Balkans there would need to be more than 600,000 troops available. That number wasn't available, and so the troops that were already there would just have to stand down for the opening months of 1916. More troops were sent by the spring of 1916, not the 20 divisions that Sarrail wanted, but more troops including 6 divisions from the Serbian army. The conditions over the summer of 1916 were miserable, not that much different than Gallipoli had been in the summer of 1915. It was hot, there was tons of malaria causes and other diseases, apparently the British alone would have 162,000 cases of Malaria. Even with the reinforcements there was little chance of any action until they were forced by a future ally, Romania. It was very important to Romania that as many Bulgarian troops be tied down as possible and so the Romanian leaders said they would only enter the war in an offensive was launched out of Salonika. This request was made in July, but an offensive would not be possible by Sarrail until September. When the attack was launched, of course without British assistance, it accomplished almost nothing. Sporadic fighting would continue on the Greek border for another 4 months before it was called off, but the French never got much past the border. Again the troops at Salonika would be idle for months before launching another attack in 1917. Again, no real progress was made. However, the failure of 1917 was the catalyst for the forced abdication of King Constantine from the throne of Greece. His son Alexander took his place, but really power was handed over to former Prime Minister Venizelos. Due to this change, and the reason it was forced by the British and French, was because when Venizelos came to power he brought Greece into the war. The final attacks out of Salonika would be in 1918, and these would come so late in the war that they were able to move into the Balkans and liberate Belgrade in September 1918. We will be back to discuss that campaign here in a few years. So, by the end of the war the forces and resources poured into Salonika over 3 years were not pointless, but in 1915 and 1916 they were looked like it. They had failed to save Serbia, and with that failure the tiny Balkan country that had the guts to stand up against Austria-Hungary would find its entire country occupied for 3 long years.